If you have read this blog for any amount of time, you probably know that I am a BIG fan of Squarespace. This website-building platform is a perfect fit for both pros and newbies, because anybody can use it to create a beautiful, professional web presence with very little coding knowledge. But this post is for my DIY folks out there! In the video above I demonstrate 4 of Squarespace's awesome features that will help you ROCK your website. These are features I use to optimize my clients' websites for email subscribers and new client inquiries. So here they are! The announcement bar is a quick and easy way to call your website visitors to action. It's etched at the top of your website, and you can type anything you want in it. Are you having a sale that you want to put in the forefront? Do you have a freebie you want people for sign up for? The announcement bar is a great way to publicize your offers and call visitors to action. You'll can turn on your Announcement bar under the "Design" tab in your Squarespace menu. Check out the video to see a demo. The lightbox form is one of my favorite Squarespace features, because according to LeadPages, this type of form can increase your conversions by up t 60%! Let me explain: Typically, when you sign up for a freebie on a website, you immediately see the form where you enter your name and email address. One alternative way is to have a button that opens into a pop-up or lightbox asking for your name and email address. 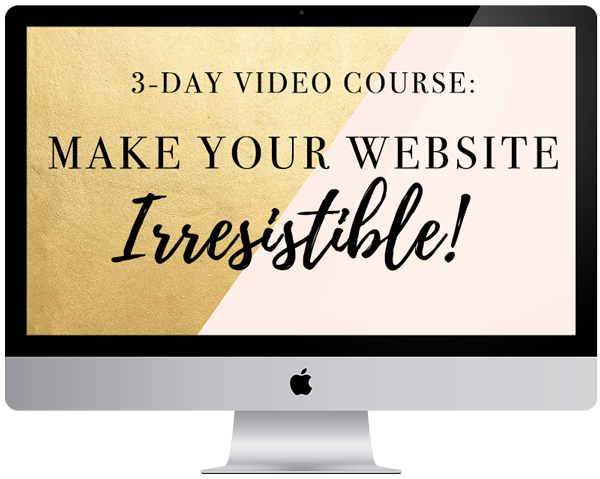 It's called a two-step opt-in, and Lead-Pages says they got a 60% increase in email subscribers opting-in when they used that, as opposed to an obvious for below are examples of a regular sign-up form and a lightbox form for my FREE 3-Day Course: "Make Your Website Irresistible"
Get instant access to my FREE 3-day course: "Make Your Website Irresistible!" I am all about the calls to action in website design. That basically means: you should never end a page without leading your visitors to the next step or desired action. One way to make sure you do that on every page is with the pre-footer area. Most Squarespace templates offer this pre-footer, which is basically a reserved area above your website footer, and you can put anything you want in there. I use this space to advertise my 3-day course. And it appears on every page! You can use the page builder to add images, text, sign up forms in that pre-footer, so get creative! Watch the demo in the video above! Cover pages are my absolute favorite part of Squarespace, because they are the quickest, easiest way to design and publish professional-looking pages in minutes. Maybe you're hosting a webinar, and want to create a sign-up form quickly. You can create a cover page and link the sign-up form to your email service provider (like Mailchimp) in 10 minutes flat! Some people use cover pages as the opening landing page for their entire website, immediately inviting people to sign up for their freebie. This can be a very effective way to roll out the welcome mat for new visitors and turn them into subscribers! Check out the video to see a full cover page demo! So now it's your turn. What are some of your favorite Squarespace features? How do you use them to optimize your site? Let me know in the comments! Share this post on Twitter: Want to rock your @Squarespace site? Check out this video training from @AnjelicaDezel!